An insight into the creation of the name for a new public service brand Intreo. Naming a public sector brand has always been an interesting and unusual challenge. Unusual in that often the client doesn’t even think that naming is a requirement when creating the new brand identity. This is because most public sector brand names in Ireland are created unwittingly by a civil servant when the Bill in parliament for the new entity is being legislated for. That is to say that with no thought for the brand, a name is created while seeking to describe what the entity does in the Act. It becomes enshrined in law. These descriptive names are often so long that they become acronyms. These acronyms are seldom phonetic, lack personality or resonance and feed into the perception of yet another faceless quango. Once such example which we worked on is the public service named Intreo. It is a new service from the Department of Social Protection and is a single point of contact for all employment and income supports. We won the contract to create the new visual identity, not for Intreo, but in fact for the National Employment & Entitlements Service or as it was already becoming known as - NEES. This was 2012 and the country was literally on its knees, from a financial crisis and bailout the likes of which the country had never experienced. Naturally enough, we were extremely reluctant to work with this name. We were also concerned about the use of the word entitlements in the name which we felt was a negative message, and the potentially restrictive focus on employment services. In the UK, the government named their equivalent entity Job Centre and soon added the word Plus as they began to realise that as a very visible pubic service with shops and locations in the community, that they could become a vehicle of other public services beyond just job activation and the name Job Centre didn’t allow for this. We therefore set about challenging our client’s thinking and through wider stakeholder engagements, deepened our understanding and began to build a consensus around the need to review the name. This warranted government approval and so we also sought the insight and support of the minister of the day, Joan Burton. 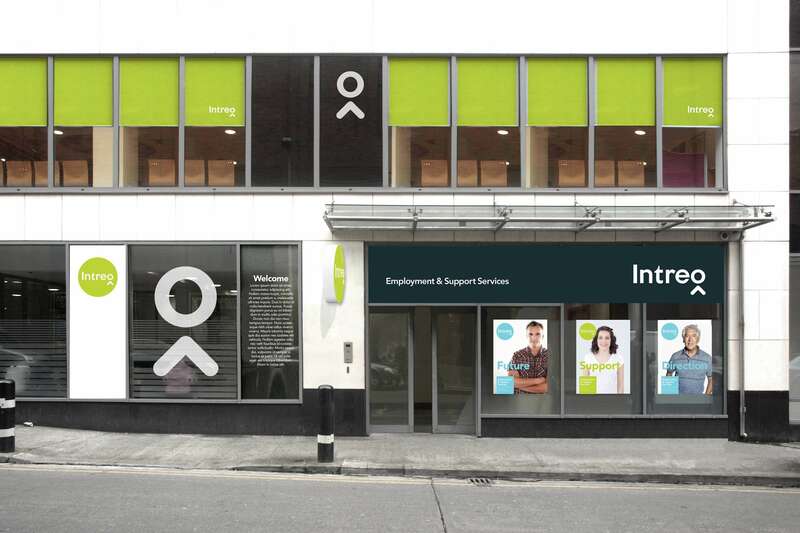 At the heart of Intreo is the concept around a one-stop-shop where unemployed persons are introduced to training and employment services, where potential employers are introduced to prospective employees and through the amalgamation of the former FÁS employment service with the CWS and Dept. of Social Protection dole offices, employees were being introduced to the new entity. Treo is the Irish for direction and helped communicate what the new brand was about, helping to give direction to those who need support. Intreo allowed us to develop a strong and distinctive visual identity, which resonated with the target audience and which was a clean and clear space for the new brand to occupy.